As the summer wanes many car owners think about enjoying one last road trip and police officers think about managing chaotic long weekends on the highways. As long as cars have been on the road, speeding has been one of the main factors involved in accidents. Some early twentieth-century letters recently processed in our archives reveal that excuses for speeding are just as old. In this post, we’ll be taking a lighthearted look at some of the bluster, wheedling, flattery, and indignation in letters written by hapless drivers surprised by a charge of speeding. There’s a serious point to be made here, though (besides that speeding is inadvisable). Archival records are like windows: the view immediately in front of you hints at what’s going on beyond the edges of the frame. Historical documents offer a highly focussed view of a particular place and time because they were created to serve specific practical or personal goals. They now tell us both about these purposes and about the world they sprang from. After we set the stage of that wider world, why not see how much of it you can see reflected in the selection of excuses for speeding that follow? 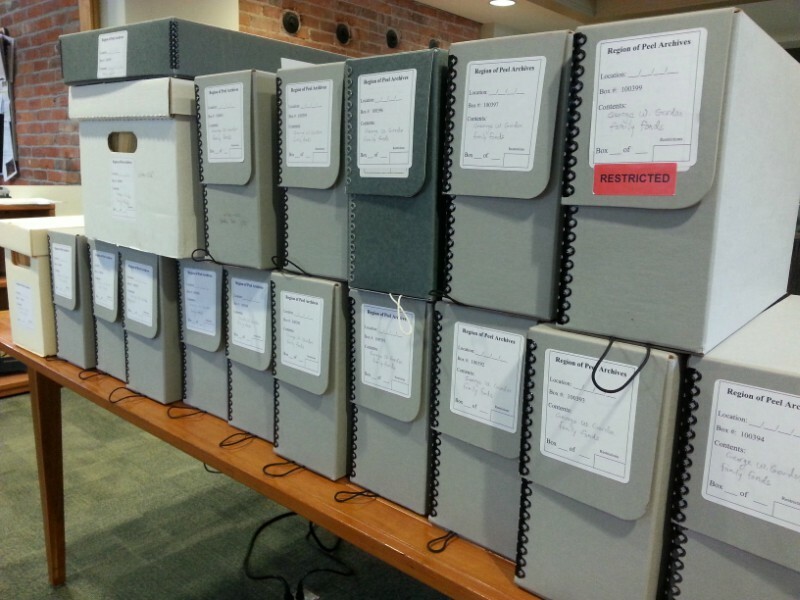 Documentation of a life lived is now packed carefully into these archival boxes and folders. Besides documenting the lives he affected in large and small ways, these records are also evidence of what George W. Gordon himself did and thought. First it’s important to ask why and how we at the Archives have files of letters objecting to traffic charges. In fact these letters are part of a much larger collection. They were donated to us by the family of George W. Gordon of Port Credit, who emigrated as a child, along with his single mother, from Scotland in 1863. Gordon went on to become a respected farmer, justice of the peace, and local magistrate. His papers reflect many facets of his life, ranging from soppy poems to his future wife to voluminous records documenting his role as an enforcer of law and order. His descendants carefully passed down his papers through the generations, adding on their own, before they passed the body of records along to us. The old Orange Hall in Port Credit in about 1928 where George W. Gordon heard many of his cases . In the early part of his career Gordon and his constables would have been dealing largely with people they knew well: in a small village the officers of the law worked and worshipped closely with many of their neighbours. But from about 1915 on, most drivers summoned by Gordon for speeding were just passing through Port Credit on a new highway in a fairly new invention: the automobile. The society captured in Gordon’s judicial papers was in the midst of transformation. A global war was raging in Europe; mass industrialization and mechanization, bolstered by expanding telecommunications and electrical lines, were continuing to change the pace and character of everyday life on the home front. The motor car had just become affordable to the middle-classes, although as yet only a fraction of Canadians owned one. Henry Ford’s mass-produced Model T rolled off the line just down the road from Port Credit in Oakville, and Canadian car companies dotted Southern Ontario. 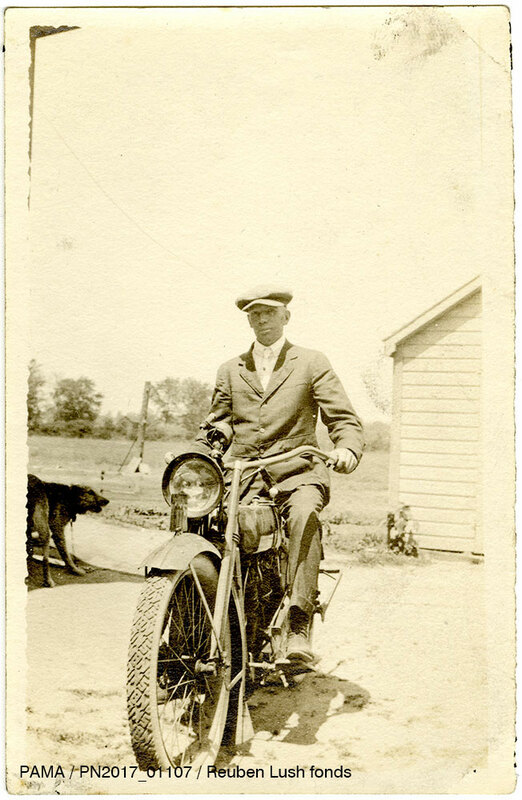 Automobiles were touted as essential to the productivity of salesmen and farmers alike, and for enhancing family life and even physical health. (For a selection of local car ads from the period, check out the gallery below). The car was changing both the physical landscape and the contours of work, residency, and recreation. Automobiles of this period could run as fast as 45 miles per hour (around 70 kilometres per hour). With increasing traffic and increasing speeds came traffic jams and accidents. New well-paved roads with enforcement of laws for efficiency and safety became a necessity – especially as cars were sharing the roads with slower horse-drawn vehicles. 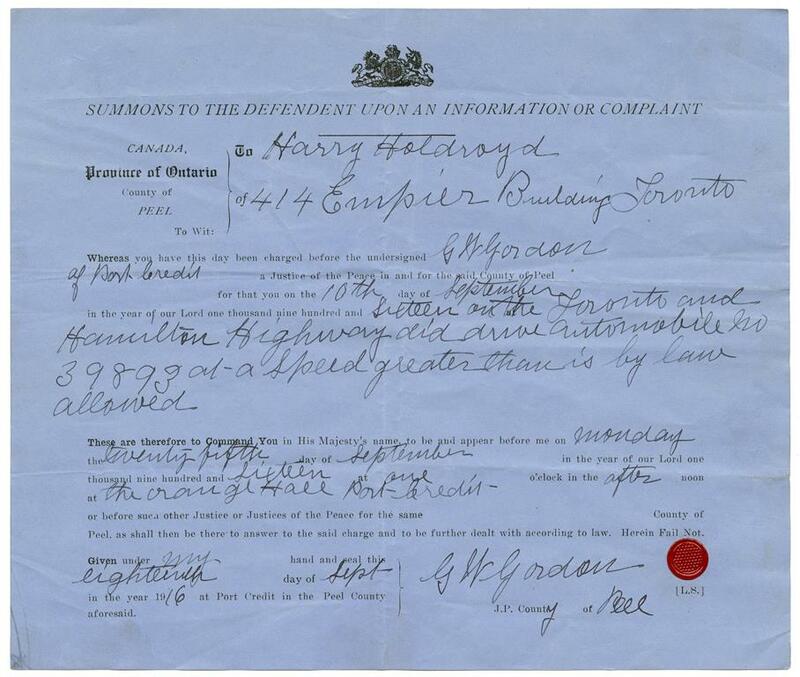 All the speeders whose letters now grace Gordon’s archives were caught on one newly paved road: the Toronto and Hamilton Highway, now known by residents of the Greater Toronto and Hamilton Area as Highway #2, or Lakeshore Road. The stretch of the Toronto and Hamilton Highway running through Peel in 1919. The highway is marked in red and runs along the lakeshore. Construction began in 1914 along a pre-existing gravel road and by 1917 the innovative concrete highway linked Toronto in the East with Hamilton in the West. The instantly busy route quickly became the road of choice for travellers moving across Southern Ontario and into the US. In 1918 a daily average of 1,745 cars passed through Port Credit, far more than the population of the village. Many of these motorists were businessmen with no ties to communities along their route. They kept Gordon and his handful of traffic officers very busy. 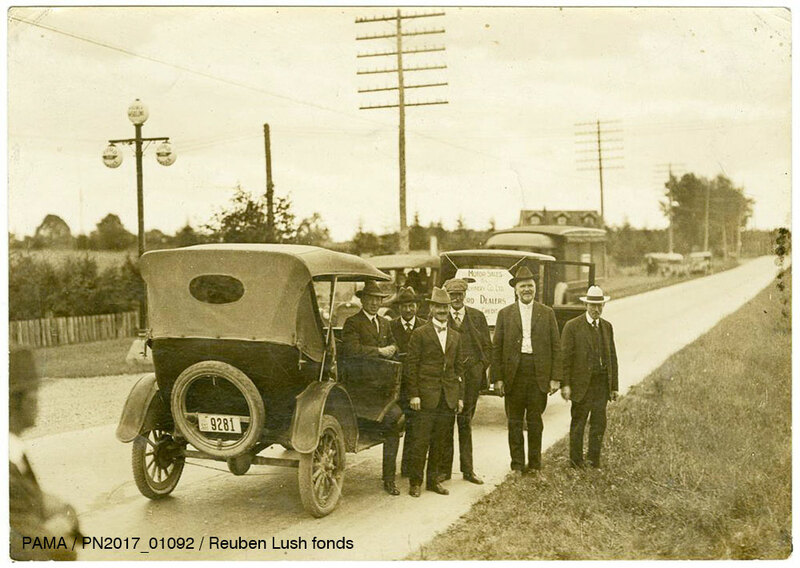 George W. Gordon is pictured here (far right) standing next to his good friend Reuben Lush on the Toronto and Hamilton Highway in about 1916. Lush hired traffic officer Sydney Hunter (see below) and was himself a justice of the peace and also a commissioner of the Toronto and Hamilton Highway. Lush once bet a neighbour that his car would be the fastest in a road race. Constable Hunter, who rented his cottage from Lush, overheard the bet and charged the racers with speeding after hiding himself in the bushes alongside the road. Lush had to face Gordon in a courtroom packed with onlookers wanting to see one local worthy charge another for speeding. Despite being caught by one friend and fined by another, Lush liked to say that the whole incident showed the justice system was impartial. Constable Sydney Hunter on duty. 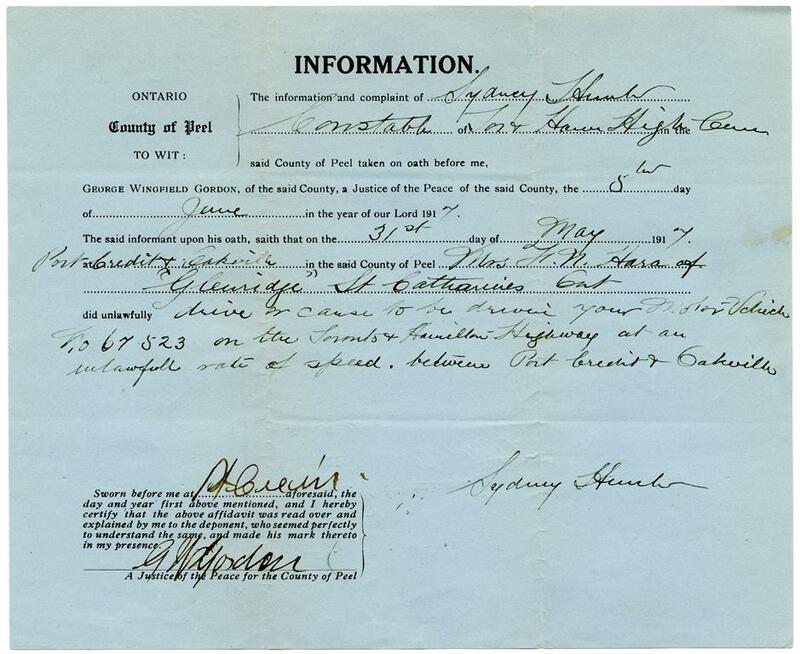 An immigrant from Wales, Sydney Hunter worked on Reuben Lush’s farm before Lush hired him as a traffic officer for the Toronto and Hamilton Highway Commission. Uniforms were not yet in use for traffic officers. but as any police officer will tell you, even impacts at “slow” speeds can result in horrific injuries and even death, as records of cases heard by Gordon attest. We don’t know if such disturbing accidents contributed to Gordon’s meticulous pursuit of speeders. Thanks to his records, however, we do know a little of how the process worked and how it buried him in mail. To catch speeders, officers of the time used a variety of methods. One understandably unpopular version involved dragging a plank fringed with nails across the road. If drivers could stop in time after spotting it, they weren’t speeding. A more common method involved “pacing”: an officer maintained the same speed as the vehicle he was following and then consulted his speedometer (somewhat unfairly, not all cars of the period came equipped with speedometers). Yet another method involved stopwatches employed by two officers at set intervals along a stretch of road. Because a charge of speeding was based only on the word of the traffic officer, the officer had to swear an oath to the judge about his observations (see top image below). After tracing the owner of a speeding car, a summons was then dispatched to him or her (see bottom image below). Defendants were directed by the summons to appear in court in Port Credit on the charge of speeding; alternatively, they could simply cough up the fine of $10 (plus $3.50 for the expenses of the constable and magistrate). As many of those charged lived nowhere near Port Credit, it was onerous for them to make an appearance. Some simply paid up with no further comment. Others tried to protest their innocence, thereby unwittingly supplying evidence that could be introduced in their court appearance. Most paid up but voiced their extreme displeasure while doing so. Some had their lawyers or their own town constable write to Gordon on their behalf. 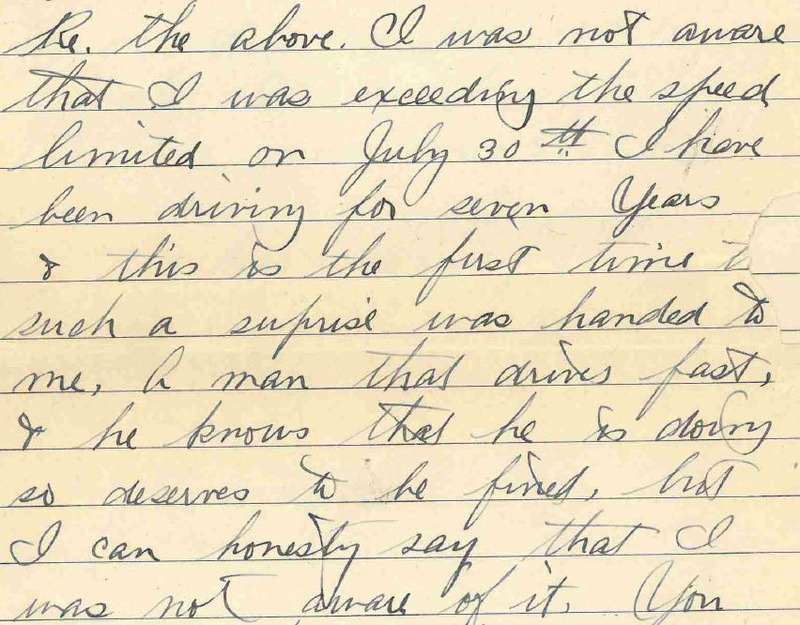 Now that we’ve inherited these letters from speedy defendants, what was once legal evidence has become another kind of evidence: a window not only on the early days of traffic control but on the personal and public situations it involved. Before leaving you with some selected passages from the letters, here’s a full-page view of one of them. 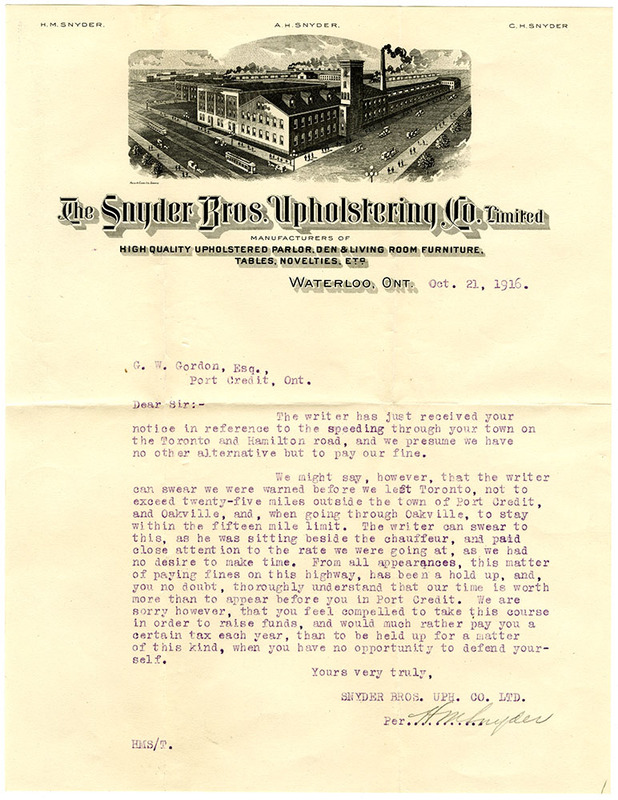 This document reveals a characteristic feature of many business letters of the time: ornate letterhead made possible by inexpensive mass printing. Precisely by using business instead of personal stationery some correspondents were likely signaling their respectability and status while venting their indignation. In this letter, the writer levels a common accusation: catching speeders is a cash grab. Without further ado, here are some selected excuses for speeding circa 1916 to 1919. (Our transcriptions retain the original spelling, grammar, and punctuation.) You’ll notice that although in some ways the world was very different 100 years ago, in other ways people have not changed much since then. I regret exceedingly that I was speeding to fast which apparently happened, due to trying out the car which I have only had for about two months. While I will admit to going a little over the limit a couple of times when a motorcycle constable came along and challenged us to a race, I think it not a fair way by any means of catching speeders, as he was speeding also, and had I not been challenged would never have thought about going above the limit. You and your good friends of Peel County who have been instrumental in making the highway such a splendid road, have made the temptation to go fast beyond the Writer’s control. I was not aware I was exceeding the speed limited on July 30th. I have been driving for seven years & this is the first time such a surprise was handed to me. A man that drives fast, and he knows that he is doing so deserves to be fined, but I can honestly say that I was not aware of it. I was not speeding, nor having the car driven wrecklessly. I have as good and as carefull as driver as any man in Canada, and you can get this information from any man in Woodstock. …my chauffeur has distinct instructions not to exceed twenty miles on the high-way and fifteen miles in cities and towns. This is an imperitive rule and I know positively that when I am with him this limit is never exceeded. The chauffeur had my Wife and Family out for a drive to Oakville, which they take nearly every week, and regret exceedingly, if they have gone over twenty miles an hour, and the Chauffeur has strict instructions, that this must never be exceeded. At the time I was stopped by the constable he stated that I was driving the car at thirty-three miles an hour. I am convinced that he is in error as to this speed. Mr. F. C. Soule, president of the Merrell-Soule Company of Syracuse was on the front seat with me and he agreed with me that the speedometer showed a speed of twenty-six to twenty-seven miles. In a car immediately following us was Mr. S. B. Trainer, secretary and treasurer of this company and Mr. Oscar F. Soule, secretary of the Merrell-Soule and they likewise stated that the speed was about twenty-six or twenty-seven miles an hour. …the speeding was occasioned by a serious trouble disturbance on the Hydro Transmission Line between Toronto and Dundas and prompt attention was necessary in consequence thereof. It was a matter of great importance that the Trouble Men should reach the source of trouble with the least possible delay that that occasioned the running of the car in question at the speed at which it was travelling at the time complained of. …as this is the fifteenth car that he has been the owner of, and has never been fined for speeding, he feels that he is being imposed upon by the commission. I beg to thank you for your leniency in this matter, although I cannot say that I owe any good feeling to the man who took my number. I have no doubt that you will agree with me that too careful surveillance of this road will have an injurious effect on values in that neighborhood, as it is altogether too expensive a road to drive over in order to get to your home. It is peculiar what small things affect one’s decisions, and the fact that I have been fined for driving has made me come to the conclusion that I will not buy a piece of land in which I was interested out there. I beg to state that I send this amount rather than sacrifice the time and have the annoyance of going to Port Credit, but I wish to state that I consider the fine exorbitant for an offence which at the most was merely technical and which involved neither damage nor danger to any person or property. It is action such as this which brings the whole system of enforcement of law into contempt. It would seem a pity to compel Mr. Yeates to attend Court under the circumstances, as Mr. Yeates is busily engaged in making munitions for the war. He has the personal supervision of a large plant, turning out a large amount regularly, and as a mistake appears to have been made we thought we would write you. We took this matter up with his father with a view to having the fine paid by him and he wrote us that his son had not given him any information about this matter and while under ordinary conditions he would have no objection to paying the amount for him suggested that as his son had given up all he has here and gone to the front this matter might be remitted. May all our readers be safe and sound on the roads in the coming weeks. Thanks to Alesha Grummet-Roesch, our archives summer student, for her eagle-eyed trawling of newspaper microfilm for car advertisements. Ontario Ministry of Transportation and Communications, 1984. Footpaths to Freeways: The Story of Ontario’s Roads. John Hunter, 1997. A Remarkable Couple: Reuben and Maggie (Margaret Coulson) Lush. You can read a description of the Gordon family papers, the George W. Gordon family fonds, at https://www.archeion.ca/george-w-gordon-family-fonds. To see the papers themselves, visit us. To find out more about how to read an archival description, check out our post How do archivists describe collections?